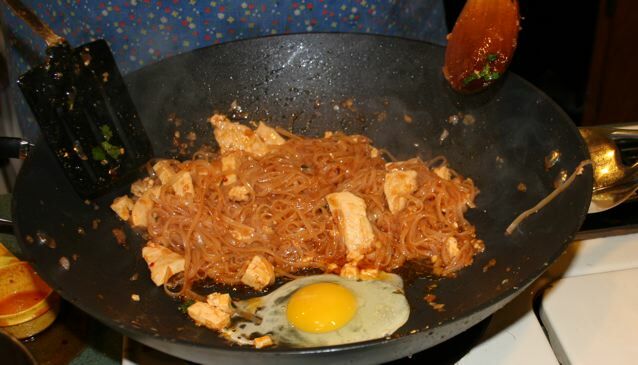 There are two very important factors that can make or break Pad Thai…the noodles, and the sauce. I will start with the sauce. I like to make the sauce ahead of time and have it ready to go as it saves time and can also be “fragrant” (a nice way of saying stinky), when you are making it so it is best to have it all ready to go when your guests arrive. 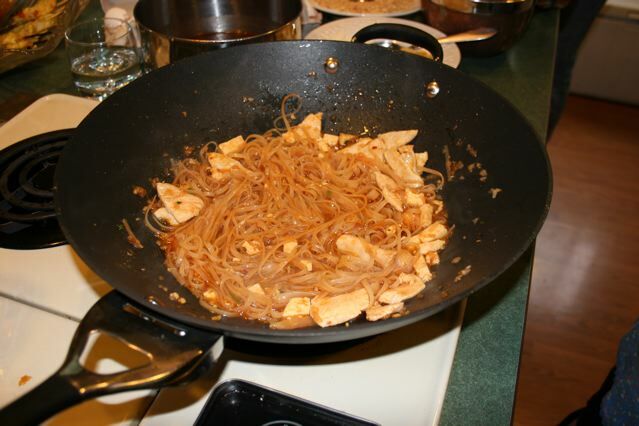 You can also save the sauce for a long time in the fridge and have it ready whenever you need a quick thai fix! Now to make the sauce, you simply mix the first three ingredients in a sauce pan over low heat until the sugar has dissolved. I have found that Palm sugar comes most often in solid form of either a block, or round little discs, and therefore needs to be melted down into the mix of fish sauce and tamarind concentrate. Tamarind comes in a cube of paste that must be mixed with water and then strained, or in a much easier form of Tamarind concentrate. The tamarind concentrate is what I use and it comes in a little plastic container. Now fish Sauce is one smelly sauce. It is a soy sauce consistency and is very salty and fishy, and you don’t want to spill this on your clothes or they will need to be washed and rewashed again…haha. 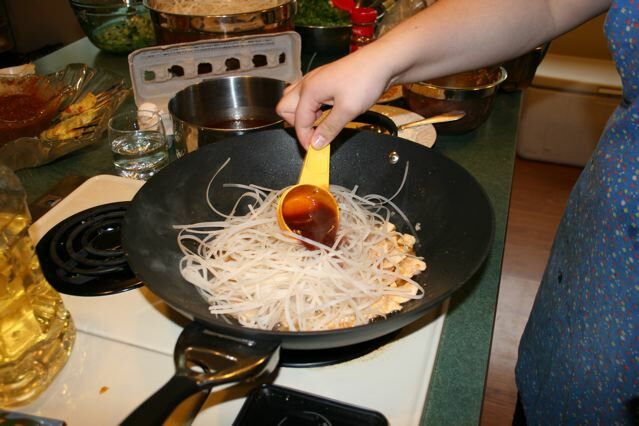 Don’t be intimidated by this Pad thai sauce or deterred if the smell doesn’t smell like Pad Thai…it will be delicious and perfect when mixed with the noodles and everything else. I keep it in a glass container sealed shut in my fridge…and it can last for weeks. 1 bag of Rice Stick Noodles also called Banh Pho Noodles. This amount should feed 4-6 people depending on their appetites. The important part of of preparing the noodles is soaking them. 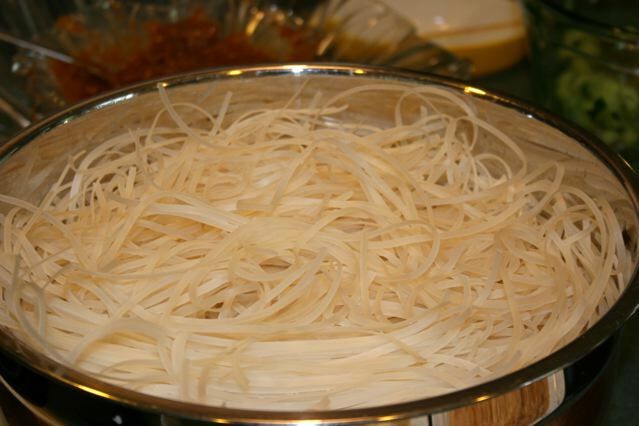 They need to be soaked in lukewarm water for 8-14 minutes depending on the specific noodles you are using. Soak for 8 minutes and then test them. They need to be flexible enough so that they don’t break when you bend them and al dente to the taste. The only way to know when they are ready is to taste them. 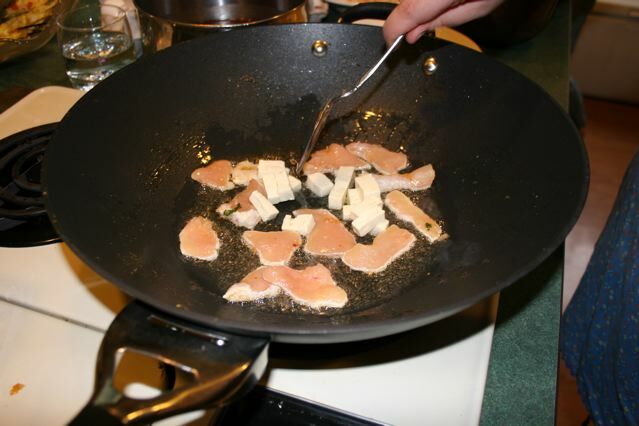 They will only be cooking for a few minutes in the wok so you don’t want them too hard, but if they are too soft, they will turn into what I call, “the BIG MUSH” in your pan and you don’t want that! It is a delicate balance and you might have to experiment a little find your perfect consistency! After soaking, drain them and they are ready to use! 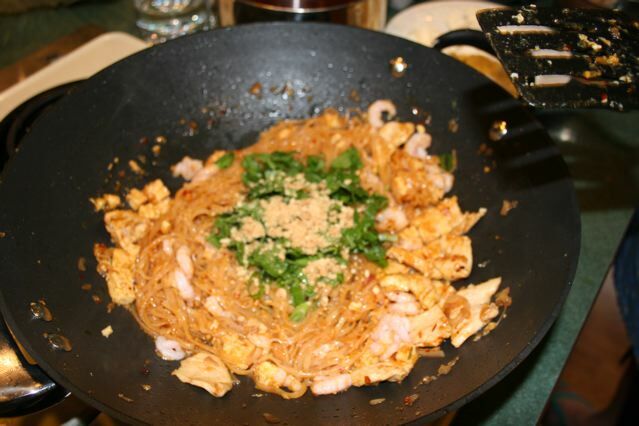 If you are making for a large party or even just a few, I have found it helpful to have whatever ingredients you are using in bowls next to the wok so that you can add them quickly and in whatever amounts you like. 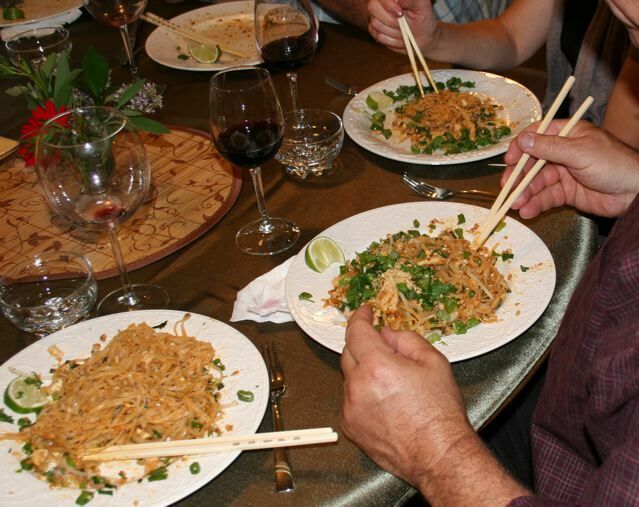 Pad Thai is a very customizable meal and often people will want extra of something, or something left out. My husband ALWAYS would like extra cilantro and no beansprouts and about 3 stars on the spicy scale. I like everything in mine, but a 2 star on the spicy scale! 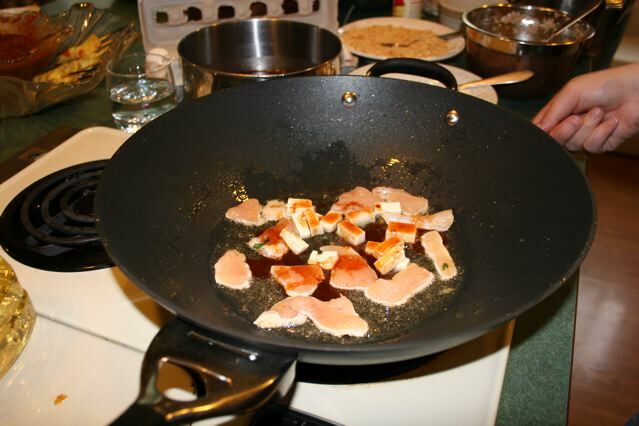 Heat your Wok until really hot and starting to smoke. 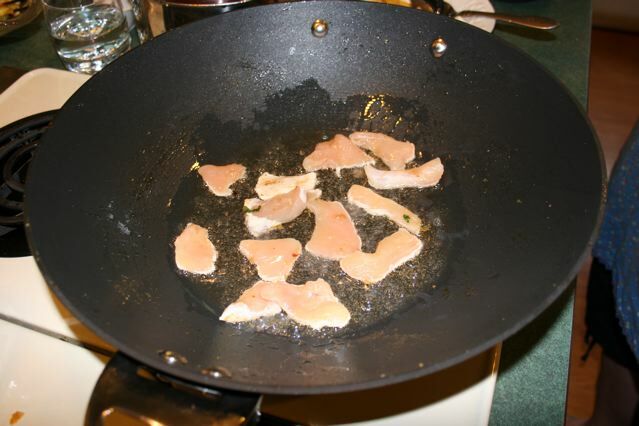 Add the Peanut Oil and then cook the Chicken in the oil for 1-2 minutes. Then Add the tofu if applicable. 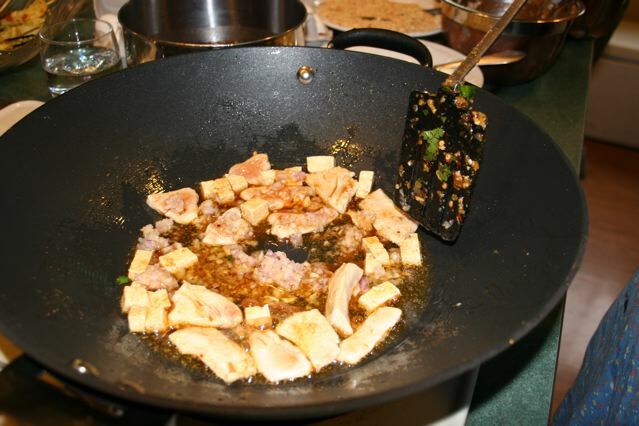 Fry that for 1- 2 minutes stirring around and add in 1-2 TBLS of Sauce at this point to season up the meat and tofu. 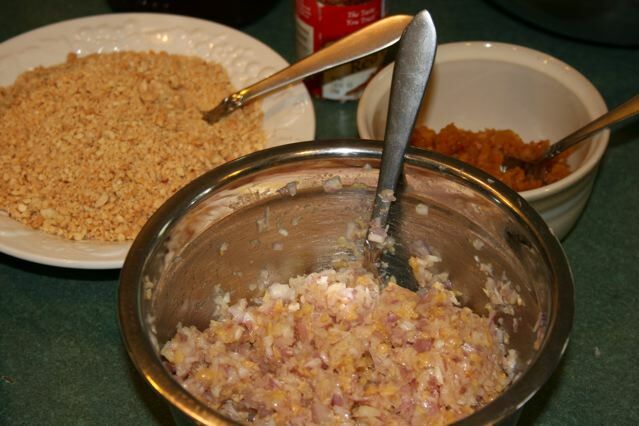 I often will mix the minced garlic and shallots together in one bowl and this is the time where you add the 2-3 Tbls of that mixture. I like A LOT of this mix as it really flavors the dish nicely! Cook and Stir this around for 30 sec – 1 minute. 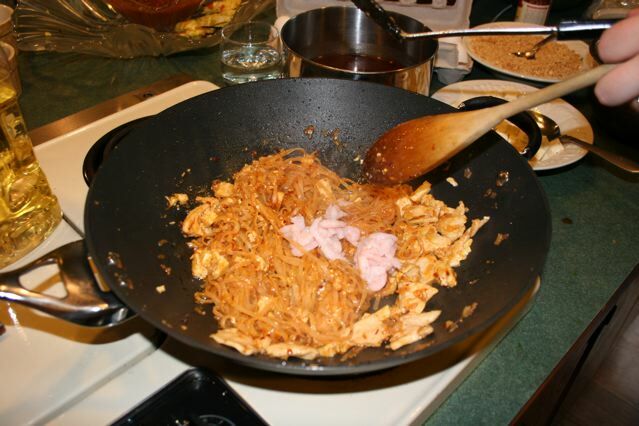 Stir this around until there is no more pink showing in the Chicken and then add 1-2 cups of noodles on top and pour 1/4 Cup of Sauce on top of the noodles and stir and toss continuously. You will continue to stir and cook the noodles, pulling them apart so they don’t become a giant glob (that is an unofficial culinary term). This is the longest phase of the cooking and the noodles should be tender at this point….and you should always taste one at this point to make sure they are done. 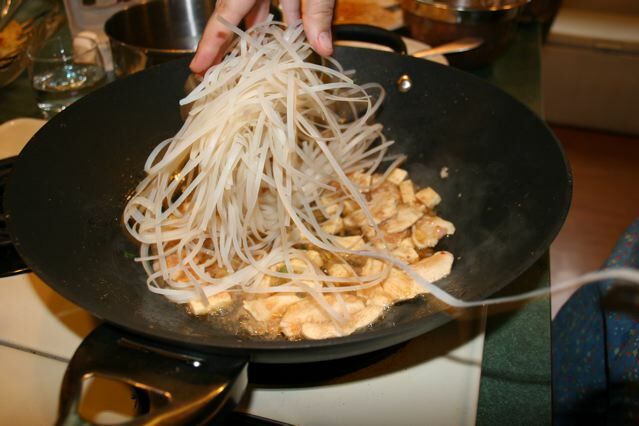 During this phase, you might need to add more sauce or a little water if the noodles need more moisture. Now it is time to add the Egg! 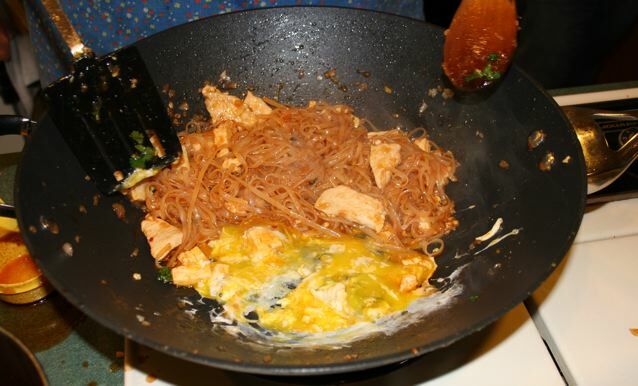 Move your noodle mixture to one side of the Wok and Crack an Egg into the Wok and scramble for 10-15 seconds, then mix into the rest of the noodle mixture, tossing vigorously! 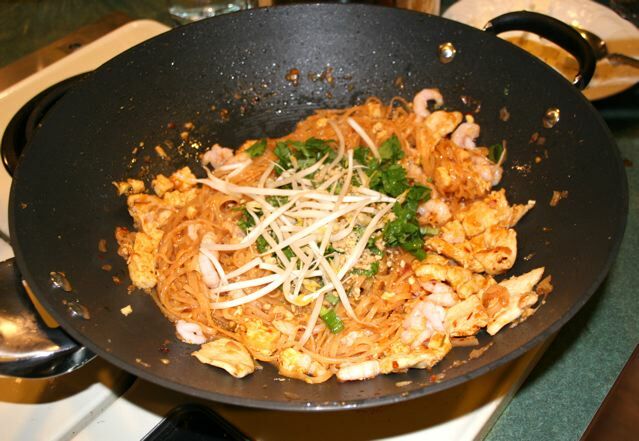 Now is the time to Add Shrimp if you are using Shrimp as it will cook very quickly in the Hot Wok. If you are adding shrimp, add it and toss quickly. Now it is time to add the rest of the ingredients. If you want it to be spicy, here is where you add your Red Pepper Flakes to whatever spicy level is desired. 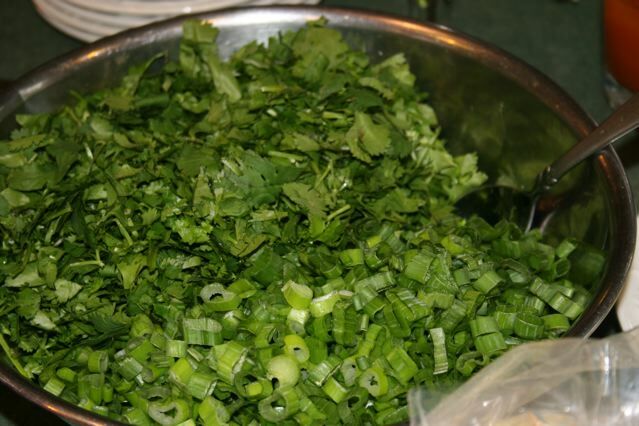 Add the Tablespoon of Preserved Turnip/Radish, the cilantro and green onions and the Peanuts and Beansprouts all at the same time and toss all together and then plate the dish! Its time to EAT!!! 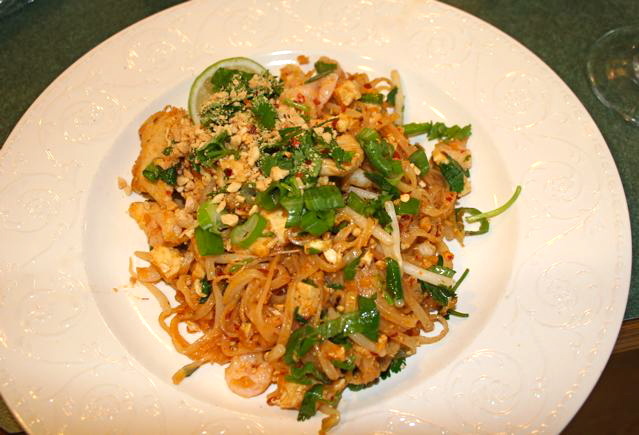 It is customary to serve Pad Thai with a slice of lime and to have more limes at the table as well as more Red Pepper Flakes or Chili sauce in case someone would like to sweeten their dish with the lime, or to spice it up a little more with the hot stuff. 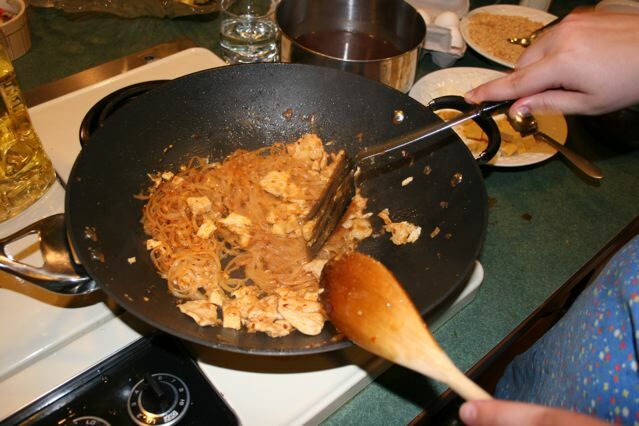 I know this is a very long post, but know that once you start cooking the Pad Thai, it takes only about 4 minutes to make each batch so it does go quickly and is worth the effort. The longest part of this whole process is prepping all your ingredients. I hope you will try this out and please let me know if you have any questions or any additions that happen to make this any better! HAPPY PAD THAING!!! « Pure Deliciousness or in other words…Ginger Garlic Pork Wontons!